I'm reading the Fantastic Magnificant 8 thread, or course. A lady who loves the classics. It is quite interesting. Mr Hancock has some interesting theories supported by archeological facts. Another interesting book he wrote is Sign and the Seal: The Quest for the Lost Ark of the Covenant, also full of archeological facts to support his theories on the subject. 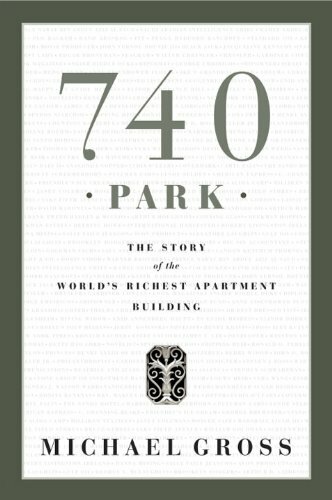 "Of all Manhattan's fabled East Side dwellings of the super-rich, 740 Park Avenue has perhaps the best pedigree. Designed by Rosario Candela and developed by James T. Lee, Jackie O's maternal grandfather, as a cooperative haven for the elite, it had the misfortune to open just as the stock market crashed in 1930 and was forced to operate partly as a rental for some decades. The last sale was to Lee himself, for son-in-law "Black Jack" Bouvier, his wife and daughters Jackie and Lee. John D. Rockefeller Jr. signed a rental lease in 1936 for a massive apartment (more than 20,000 square feet), and Marshall Field III took another. Gross (Model) has solidly researched the denizens of the building, who they were, what they did, and who and how many times they married. This information, while exhaustive, is also exhausting. Things perk up as we approach the modern era, and the old rich give way to a newer cast of sometimes dubious billionaires. Ron Perelman, Henry Kravis, Steve Ross and Steve Schwartzman are cited among the newer tenants. A bit of a bore for average readers, this will be a useful tome for those interested in New York's social history." I pass by the building a lot (and can't afford to breathe the air around it), it's an interesting building. The book is basically 1/3 history, 1/3 architecture, and 1/3 gossip column. Right now, I'm reading "The Undiscovered Self" by C G Jung- it's a nice short read (albeit a very old read ) about the individual vs the State, and the psychological effects of one mentality vs the other. Last edited by lizzie; 12-19-2010 at 10:30 PM.. This is a tric question, right? I'm reading your post. Other than our huge used bookstore, I mostly use Half.com for used books. Barnes & Noble for everything else.